A Lesson in Vintage Jewellery Care & Storage | Oh, for the Love of Vintage! As you are know, I collect and wear vintage jewellery of all decades and varieties. Recently a reader referred to me as the ‘Queen of Vintage Jewellery,’ which was very sweet! When I started this blog, I purposely created the ‘A Lesson in’ series to help you learn more about particular jewellery genres and materials. I think it’s great that posts like ‘A Lesson in Mustard Seed‘ and ‘Oh, for the Love of…Jelly Bellies‘ inspired some of you to go and purchase those items for your collection. I like spreading the love! One thing that’s very important, but often overlooked, is the care and storage of vintage jewellery. Vintage jewellery is often quite fragile, so we want to take very good care of it. I myself have been lax on organizing my collection until just recently. I wanted to share with you my progress and also some handy tips for care and storage. Since I began organizing my collection, I realize that I have thousands of items. Certainly a lot more than I estimated and certainly a lot to store properly! It’s amazing how much jewellery one can neatly shove in a box and not even realize how much is in there! 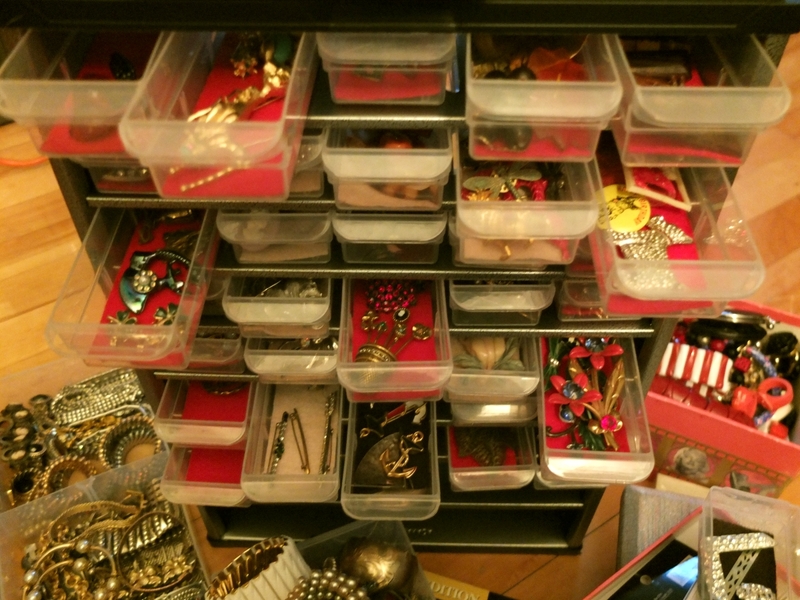 My jewellery was spread out and stored in several different jewellery boxes and cases. I could never find what I wanted and was getting very tired of digging through boxes to find particular items. I decided the best way to organize my jewellery was to buy a hardware organizer. You know the kind – the type that you find in a garage where nuts and bolts are kept. I purchased mine at Wal-mart, but you can find them at any department or hardware store. They range in cost from $20 to $50 depending on the size, number of drawers and casing. What I like best about using a hardware organizer is that you get a several drawers to store your items in. 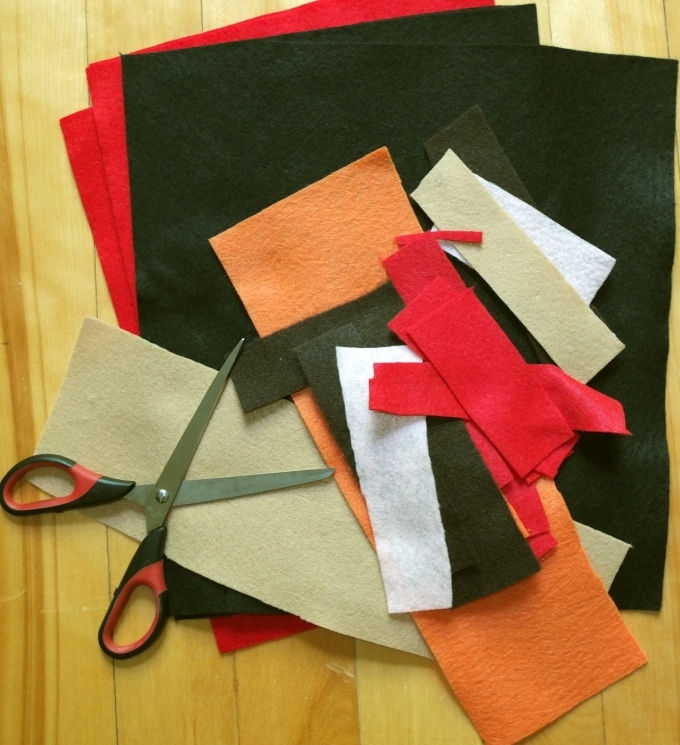 I also bought some felt, which I cut to size to line each drawer. Why did I do that you ask? Because you DO NOT want your vintage jewellery to touch plastic. Felt is very inexpensive and you can purchase it at department stores or dollar stores. Mine cost $2 for about 6 sheets. 4. Start carefully placing your items in your organizer. How you organize them is up to you. Mine is currently organized by jewellery type or theme. I have a few drawers for jelly belly pins and a few for Scotty dog jewellery – you get the idea! Did I get all of my jewellery into one organizer? No, I still have a long way to go! I think I’ll probably need about four more of these containers to get everything organized properly, excluding necklaces. Some of the boxes yet to empty, below. This excludes the jewellery in my boudoir! More organizing to do! Black Dahlia gets organized. DO NOT let your jewellery be exposed to dust, water (unless testing for Bakelite), heat, moisture or direct sunlight. If you need to clean something, read further for care instructions. DO NOT spray anything near your rhinestone jewellery; no perfumes, hairsprays, etc. DO NOT store your jewellery in zip lock bags. This is a big NO-NO, even though some people recommend it. Yes, it makes everything neatly organized BUT moisture can easily be trapped inside which will damage your jewellery. Your pieces need to be able to breathe! Store your most precious items in soft lined pouches/baggies, those made particularly for jewellery. Store pieces individually. Meaning, DO NOT store your pieces on top of each other. Ideally, each piece should be laid out so that it doesn’t touch another piece. I haven’t achieved that yet and I’m uncertain if I ever will. That would mean A LOT of organizers and thus A LOT of money. I had to have items touching one another, however, I’m very, very careful at handling my pieces. Celluloid should be stored in a dry place, which is best for all jewellery anyhow. If you have a crumbling piece of Celluloid, DO NOT place it anywhere near another piece of Celluloid as the disintegration will spread and ‘infect’ your other pieces. Think of new and inventive ways to store your jewellery. I have a lot of Bakelite bangles, so I came up with the idea of storing mine on a paper towel holder! Since Bakelite is very hard and will not chip or break unless you drop it, it’s safe to store in this manner. You have to be very careful when you clean vintage jewellery as it’s very fragile and easy to injure. No matter what you think, NEVER immerse your jewellery in water (unless Bakelite testing). I never clean my vintage jewellery save for occasionally polishing silver. However, if you need to clean something follow the below tips. 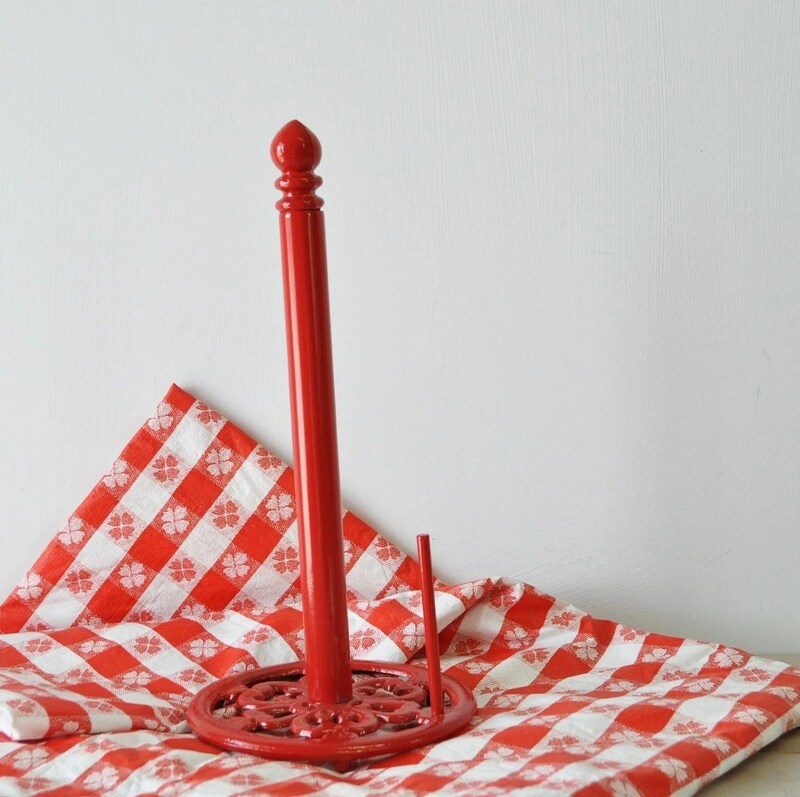 If you need to clean an item, be sure you know what the material is so you can select the best cleaner/polisher. DO NOT use a cleaner that contains alcohol or ammonia. For rhinestone jewellery, the best option is to put a tiny amount of Windex on a Q-tip to lightly clean the rhinestones. DO NOT spray the cleaner directly on the item. Never use silver polish or soap to clean rhinestones. I’ve heard that using baby wipes to clean rhinestone jewellery works well, but I’ve never tried it. Let me know if you have! You can use a polishing cloth, just make sure it’s appropriate for the item you’re cleaning. ALWAYS dry your items throughly after cleaning and before storage. If you have any storage or cleaning tips to share, please comment below! I’d love to hear from you! Hmmm. Why can’t vintage jewelry touch plastic? Chemical reactions? Hi there! I think it’s because plastic attracts moisture and you don’t want your jewellery to ever come in contact with moisture (it damages it). Whether it’s a zip lock bag, or a container, moisture is easily trapped inside. Also, a lot of the vintage plastics are best not touching each other, or plastic containers. What a thoroughly fantastic, detailed, helpful post – thank you very much for putting it together. Your vintage jewelry collection is mind-blowingly awesome, and it’s clear that you love and care for each piece so much, which just makes it all the more wonderful that such a trove of yesteryear accessories get to live (and be adored) by you. Using a hardware organizer is such a genius idea. That would work for organizing cosmetics too! I have got to snoop around Wal-Mart next time I am there. Great idea! Hi Shannon, using it for cosmetics would be amazing! Right now mine are all in a drawer with little baskets. Hmmm, guess I need another one! I’m always in search of a better solution for organizing my cosmetics and nail polishes. This would certainly prove helpful. 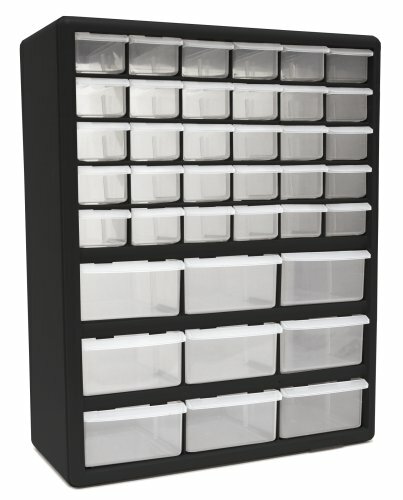 The hardware organizer is a great suggestion – I have some of my 50’s lucite necklaces in a stationery organizer so there are several necklaces banging around together – not good. Also, the felt is a great idea. I found a few metres at an op shop which i can’t see myself making clothes out of! Thanks! Hi Trish, I haven’t even begun to tackle my necklaces! *sighs* That’s a whole other storage issue. Hope the hardware organizer works out for you. I need to get a couple more and get back to organizing! Thanks for the great tips! I have been collecting vintage jewelry for about 30 years and storage of many of the items can be difficult! I have stored my in nuts and bolts cases for years, but as you said, can become expensive. So I purchased several rolling car carts with drawers. I used some thick quilt batting and covered it with burlap and a light cardboard base. My goal was not to have my broaches slipping around every time I opened the drawer. And and could gently ease my broaches into the light weave of the burlap using the pin backing. It also prevented the broaches from touching each other. I recently decided to reorganize my earrings using the jewelry trays that are lined with a light felt and has compartments. I purchased about a dozen of these so that larger earrings would have room to breath and not touch each other. Then I put them in a single drawers of the rolling carts. Some years ago I stumbled on some plastic that cut be cut to size to store my necklaces and bracelets. 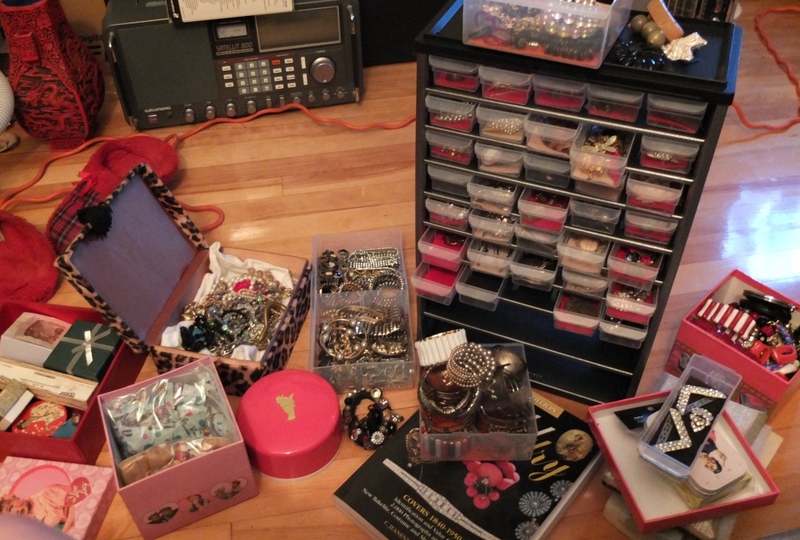 Time to re-organize these as there are too many necklaces in one compartment. And some need to be stored flat like the pearl and rhinestone collars. For my special sets, I have purchased jewelry displays with glass tops. The fit nicely into a drawer and I do not have to hunt for them constantly! I also label my drawers as I sort by gold, silver, pearl, rhinestone etc. That way I can find things quickly. I have also stored some of my bracelets large fishbowls as the heavy bangle bracelets are easily seen. I plan to re-organize my necklaces tonight! What an ordeal. I have sets with earrings, so I like the idea of jewelry pouches. I think I will try the organdy pouches with a drawstring. I need to see what color the earring are! I will be stopping on the way home to pick up some felt! Would you recommend storing your jewelry in it original box if you have it? And then using the methods you talk about for the item you don’t have the original box. I would love to know the answer to tat as well. I purchase a lot of vintage jewelry at auctions, and the box is the first thing I throw away. I find that for me it holds moisture and people often have stored their jewelry with the cotton that came in the box. And i notice an odor and often times the stones are loose. That is why I trash the box cotton and all. I do hold onto the vintage hard boxes and may store them away from the jewelry for effect. Vintage & Costume jewelry and fashion accessories aka Yes this topic matters.